What makes grilling so intriguing? The marinade, the “special” sauce, or just the natural flavor of the ingredients. You’ve spent a lot of time prepping your meats for grilling. Don’t let all that hard work go to waste. Whether you choose to grill over charcoal or gas, the real art of grilling is in the heat. Clean that grill. As you are warming up the grill, grab a grill brush and give the rack a good hard scrubbing. Using a sop mop (brush), glaze the rack with some oil to prevent sticking. Close the lid. Slow and steady. Let the grill warm up to temperature. Play a game with your friends and family; do whatever it takes to leave that grill alone! Get it up to your desired temperature (most grills have a temperature gauge. If not, stick a heat resistant thermometer in the grill to get a reading). Open grill vents to lower the heat if it your grill gets too hot. High heat and no flip. High heat sears the outside of the food to create intense flavor. It also prevents sticking. Leave the food alone and try not to “flip” it too often. If you are cooking more delicate items, use the top rack for shrimp, vegetables or fruits. You can smoke your foods too. Convert your grill into a smoker. Add flavor by placing a metal container filled with wood chips in a water bath (you typically find this in smokers). This technique is great for grilling seafood, more delicate food. Get your family involved. Grilling isn’t just a “man’s” job. Teach your kids the proper etiquette in grilling. Tell them to be careful around open grills. And encourage them to use long and sharp tongs. Show them how to flip burgers and hotdogs. Temperature reading. Poultry cooks at around 160-165 degrees fahrenheit. Beef and lamb around 125 to 145 degrees fahrenheit. Pork is at around 145-160 degrees fahrenheit. Seafood cooks until it flakes (for fish) or when it turns opaque (shrimp and scallops). Vegetables are set cocked until they caramelize on the outside. Room for marshmallows. 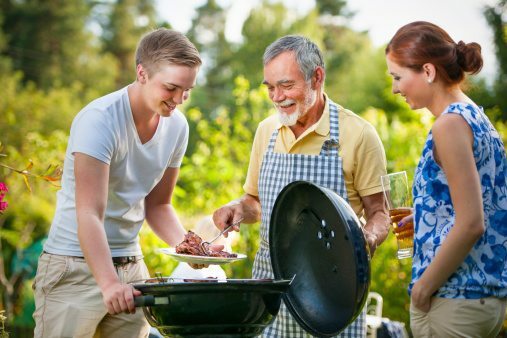 Grilling is a staggered cooking process– especially if you are cooking for a large group of friends and family. Some people may be ready for dessert once all the food is off the grill. Before you turn the grill off, stick some marshmallows on a stick and “roast” them over the grill. Believe it or not, you can achieve nice caramelization outside the marshmallows without an open fire.